For the ultimate wedding or debutante glove, Simply put you cannot find anyhing more elegant and more distinctive. Pure white and styled in the classic 12-button opera length with a traditional mousquetaire three-button wrist closure, they extend just beyond the elbow, with their impeccable quality visible in every stitch. They are crafted from the best Italian lambskin leather and lined with the finest Italian silk, which wraps your full arm in luxury for the entire day. We import these long leather gloves from Italy, where designers at Fratelli Orsini craft them exclusively for us. Made in Italy by Fratelli Orsini. SIZING HINT: These gloves run true to size. 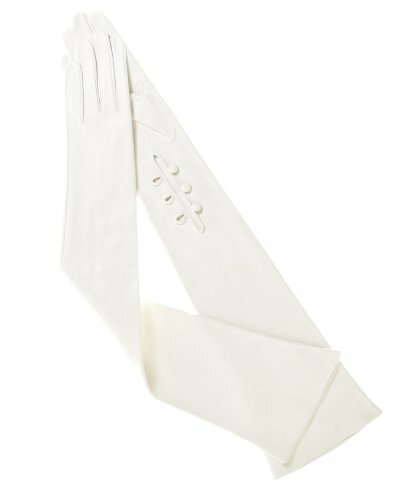 Highest quality women's Italian opera gloves with silk lining * The "classic leather wedding glove"